At SmithGroup, we are focused on exploring ways to Design A Better Future. We know that one of our opportunities to achieve this objective is by promoting efforts to create a more diverse workforce in our industry. 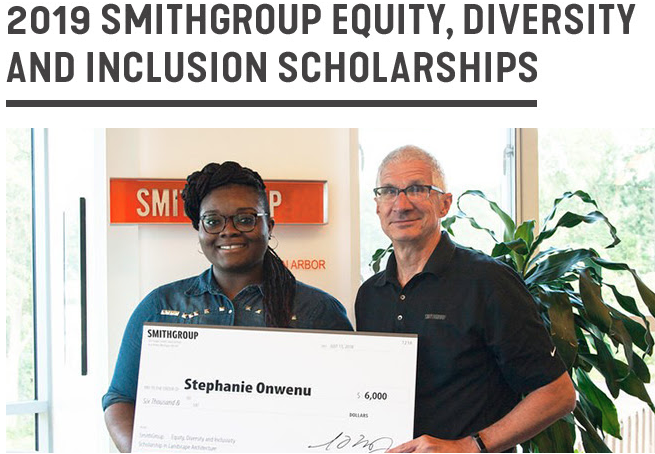 In support of this goal, we are proud to announce that we are now accepting entries to the 2019 SmithGroup Equity, Diversity and Inclusion (EDI) Scholarship Program. This program was established to support and mentor students from historically underrepresented demographics (which includes women and ethnic minorities) in architecture, interior design, planning, landscape architecture and engineering. The program’s mission is to provide these students with the opportunity to attain their professional goals while advancing the architecture/engineering/construction (AEC) industry and improving the built environment. We will be providing a one-time award of $6,000 to five talented students to help offset their tuition at their current academic institution. Additionally, the scholarship recipients will serve as paid summer interns at any SmithGroup office in the United States where their discipline is located. The deadline for entry is January 18, 2019, so we encourage you to share this information with the faculty, staff and students at your institution and invite eligible students to apply. If you have any questions, please contact us at scholarships@smithgroup.com. We look forward to receiving the entries from your students! Click here to learn more!